Try our version of a classic! 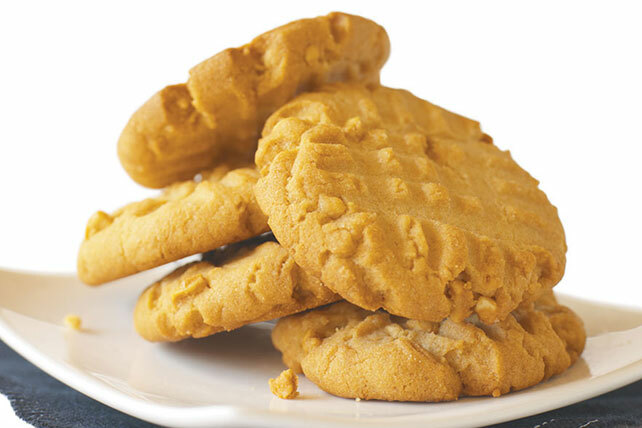 These Old-Fashioned Peanut Butter Cookies are a tried and true crowd-pleaser with their creamy peanut butter flavor. Mix first 4 ingredients until well blended. Beat butter, peanut butter and sugars in large bowl with mixer until light and fluffy. Blend in eggs and vanilla. Gradually add flour mixture, beating well after each addition. Drop tablespoonfuls of dough, 2 inches apart, onto baking sheets sprayed with cooking spray. Flatten each, in crisscross pattern, with tines of fork. Bake 8 to 10 min. or until golden brown. Cool on baking sheets 3 min. ; remove to wire racks. Cool completely. Sweets can be part of a balanced diet but remember to keep tabs on portions. After cookies are completely cooled, wrap tightly in plastic wrap and place in airtight container or freezer-weight resealable plastic bag. Place in freezer. Cookies can be frozen for up to 1 month. Bring cookies to room temperature before serving. Prepare using crunchy peanut butter.